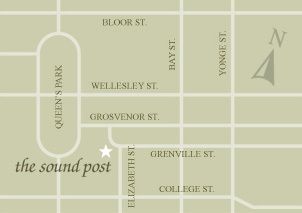 The Sound Post is located in Toronto at 93 Grenville St., one block north of College St., west of Bay St. We are just a few minutes walk from both the Queen's Park subway stop and the College subway stop. The Sound Post will be closed on Good Friday April 19th, 2019. Regular hours resume Saturday, April 20th, 2019. If you are driving, The Sound Post has free parking available for customers. We share a parking lot with U of T so please look for the spots directly behind the store marked "The Sound Post" in white paint. Please do not park in U of T spaces.